The Spectrem Affluent Investor Confidence Index Year in Review: How Did 2015 Impact How the Affluent Will Invest This Year? In March 2015, a lackluster jobs report and market volatility driven by speculation over whether the Federal Reserve would raise its interest rates for the first time in nearly a decade played havoc with the Spectrem Affluent Investor Confidence Index, which dropped four points to a 12-month low. In September, the Index dropped in the wake of late August declines in the Dow Jones industrial average on concerns over China’s economic slowdown. These are just two prominent examples of how our Affluent Investor Confidence indices capture the pulse of the confidence Affluent and Millionaire investors have in the market and the economy, and the impact those factors have on their investment plans and household outlook. Investor Attitudes: Entering 2016, our new whitepaper, reviews indices activity throughout 2015. The attitudes and investment behaviors are a predictor for financial advisors and providers as they navigate volatility in 2016. Instituted in February 2004, the Spectrem Affluent Investor Confidence Index (SAICI®) and the Spectrem Millionaire Investor Confidence Index (SMICI®) measure the investment confidence and long and short term outlooks of the 16 million households in America with more than $500,000 of investable assets and those with at least $1 million, respectively. The indices are measured on a scale of -50 to +50 with scores of 31 to 51 indicating a bullish outlook, 11 to 30 mildly bullish, 10 to -10 neutral, -11 to -30 mildly bearish and -31 to -50 bearish. In 2015, the SAICI began the year at 7. It ended in December at 3. There were only two months last year when the Affluent Index was in positive double digits or “mildly bearish.” It markedly posted declines between July and October, a period of extreme market volatility spurred primarily over the economic slowdown in China, the world’s second largest market. Millionaire investors are generally more confident than their affluent counterparts. This is reflected in the SMICI in 2015, which was in double-digits for 10 of 12 months last year. But it, too, was not immune to market volatility, and ended the year at 11, only one point higher than it had been in January 2015. 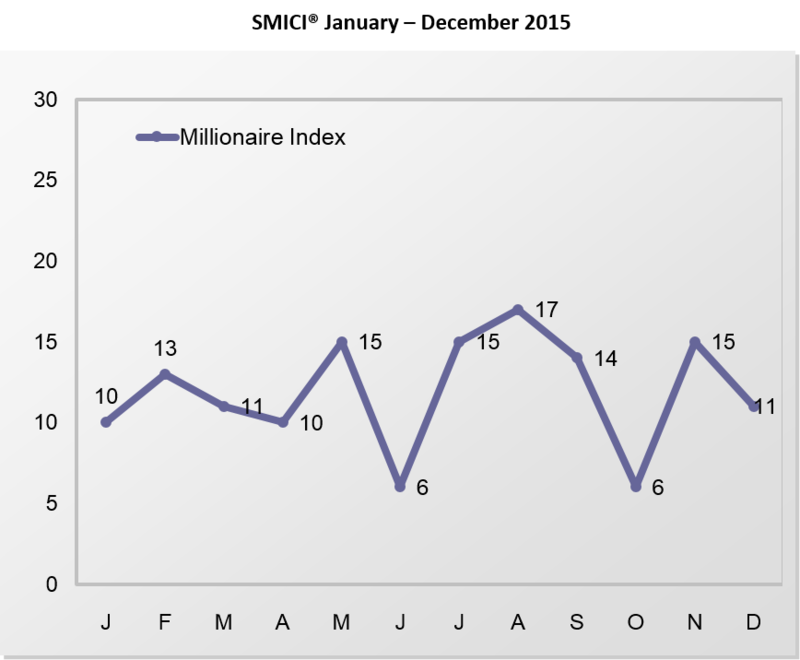 One driver of indices activity is a monthly survey for which we ask affluent investors how they would invest $100,000 if it was made available to them. For eight months last year, respondents indicated they would hold on the investment sidelines and not invest in such options as stock mutual funds, stocks and cash. In January of 2015, “not invest was at 30.80 points. In December, it was at 41.20, a 16-month high. This is another indication of the concerns over market volatility as well as the overall direction of the economy. A third driver of the SAICI and SMICI is the Spectrem Affluent Household Outlook, a monthly measure of four financial factors that impact investors’ daily lives. The factors include: Household Income, Household Assets, Company Health and the Economy. The overall Household Outlook began the year at 25.60 and ended at 15.30. Lagging confidence in the economy was a significant drag on the Outlook. Over the course of the year, there were seven months in which Affluent respondents indicated a decline in confidence in the economy from the previous month. Confidence in the economy never increased for two consecutive months in 2015. It declined three months in a row to end the year.